There's a lot of stuff in my Gallery, so if you're looking for something specific, try and look around there. Hi. I am an indie filmmaker. I also do graphic design, I collect Nintendo games, and I do some game research. I was one of the three founders of the popular online fan-game Super Smash Bros. Crusade, which I worked on for five years starting in 2008. After I left development after the game's successful demonstration at APEX 2013, the game is still being worked on today by a dedicated community. I now have an art pack called Roster Builder which gives you all of the assets you could possibly need to make your dream roster for Super Smash Bros. I hope you enjoy my submissions and all. Favorite visual artist Mmmmm not sure Favorite movies Star Wars, Back to the Future, Indiana Jones, Jurassic Park, Amadeus, Willy Wonka, The Wizard of Oz, Toy Story, The Room, The Dark Knight Trilogy, American Graffiti Favorite TV shows Star Trek, The Office, Parks and Rec, Fresh Prince, Family Ties, Star Wars: The Clone Wars, Gilmore Girls, Friends, That 70s Show Favorite bands / musical artists Beatles, Queen, Chicago, Styx, Toto, ELO, Andrew Gold, Billy Joel, Phil Collins, Foreigner Favorite books Catcher in the Rye, Catch-22, Jekyll and Hyde Favorite writers William Shakespeare, Arthur Miller, Oscar Wilde, Lawrence Kasdan, Aaron Sorkin Favorite games Super Smash Bros. (All of Them), The Sims (Gamecube), Sonic 2 (Genesis), Zelda: A Link Between Worlds (3DS), Mario Kart 8 Deluxe (Switch), Roller Coaster Tycoon 2 (PC), Sim City (SNES), Star Wars Battlefront II 2005 (PC), Super Mario Odyssey (Switch) Favorite gaming platform Anything Nintendo, Sega Genesis Other Interests Film & Movies! Jan 19, 2019 Roster Builder Ultimate is Now Available! 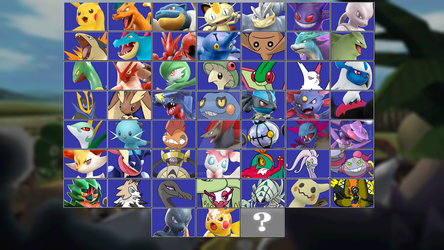 Dec 21, 2018 Roster Builder Now Has 2000+ Character Icons! Nov 1, 2018 What 5 Fighters Could be Ultimate's DLC? Sep 28, 2018 Just made a Super Smash Bros. parody for work. Aug 8, 2018 New Roster Builder Update! Jul 5, 2018 Why Is This Photo Hidden in a GameCube Game? Roster Builder and Roster Builder Ultimate now have Joker and his alternate costume! You can get the April 2019 update for both art packs now! It's a very minor update, but great for Joker fans! I would love to see Nintendo re-invent Virtual Console for the Switch. I feel like it should essentially be a digital library for your old video games. One of the main reasons that players emulate Nintendo games is to replay the games that Nintendo no longer sells. Older games have become increasingly difficult to find, and Virtual Console could be a solution to Nintendo's obsolete hardware problem. Why leave behind generations of video games when you could easily sell digital versions of them? Not only could games like Cubivore be enjoyed more easily, but games that never released in North America like Nintendo Puzzle Collection could finally be available to western audiences. This would be a great way to introduce younger gamers to titles that have greatly influenced Nintendo such as F-Zero GX and Super Mario Sunshine. 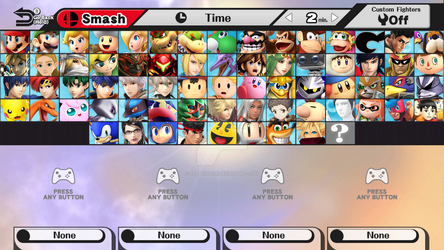 Also, adding local or online play to games like Super Smash Bros. Melee could be a big sell. This is just showing possible GameCube titles, but I think all of Nintendo's past consoles would be available. You probably noticed that I even listed the Satellaview as well. Why not give players a chance to experience those unique games and re-create the Satellaview's SoundLink feature? I think it could be really fun to collect games this way. I am sure it would also be possible that some games could come free with Nintendo Switch Online, or a subscription to the Online service could unlock special titles such as the Pokémon Colosseum Bonus Disc (a fun way to obtain Jirachi in the newest generation). Just a thought. I know I've only listed Nintendo consoles, but I am sure there would be consoles from other game companies like Virtual Console had before. Would love to hear what people think! The poster I designed for NOSTOS 12 which I wrote, directed, edited, and produced alongside some great folks. Thanks to the on-set photographer Patch Agan for the poster photos! I came across this today on Reddit. What a use for Roster Builder! Hi Connor, I am new to DeviantArt and I really like the roster builder you create, can I suggested what characters should you add in the roster builder? Hi! I can't guarantee that suggestions for Roster Builder will be added, but I am always open to hearing suggestions for new characters! Hi, quick question. Are you still supporting Roster Builder or have you suddenly abandoned it? Hi! Good question - thanks for reaching out! Roster Builder Ultimate released about two months ago, and it's been three months since the latest version of Roster Builder was released. I have ideas for future updates, but I am not certain when those will be. I have to have a pretty good bit of free time for Roster Builder, and that usually happens during the summer or holidays (every major update for Roster Builder has been released in May, July, December, or January). Roster Builder did receive frequent minor updates as new content was announced for Super Smash Bros. Ultimate. That's about all I can share to let everyone know what the circumstances are and how things have been! After hitting over 2,000 icons in Roster Builder, I hit a pretty big goal of mine, so I am not sure if future updates to Roster Builder will be as substantial as they have been in previous years (i.e. RB4 had about 900 icons while RB5 had 1,700, which is a pretty big jump). I would also like to explore more options for stages and potentially release assets for items, trophies, or maybe other elements. The primary demand has been for characters as far as I can tell. We'll see! Could we see a versus screen like this ( i.ytimg.com/vi/UJ08_Mo8CDQ/max… ) in the near future? Hi! Sorry for responding so late. This is a neat concept! I'm not sure if there are templates for this already or not. It's a possibility to explore! However, I do have limited time available to create content for Roster Builder, but we'll see! What do you think of the genre/concept of Isekai? Isekai Shokudou and Isekai Izakaya Nobu are both about an eatery that functions as a transdimensional nexus point to a world with the environmental theme of a Medieval Age/Renesaince Era setting and the combined chef-and-owner being a Badass Pacifist who plays the role of a negotiator and pseudo-embassador. You can find the anime adaptations of those two series on either WatchCartoonOnline and/or GoGoAnime. One notable thing about the differences between those two series is that the latter is like an Isekai version of the classic TV show Cheers, while the first one is more about a restaurant that functions like a transdimensional hub-like terminal for various individuals of different species and/or culture. Sorry, I just wanted to know your opinion regarding Isekai. It is a concept which doubles as a genre, focusing on what the term translates to; Isekai means "Other World", which means alternatively 'Another world' or 'Otherworldly'.